In the beauty of the Cinque Terre, in their people and in their landscapes, Catherina Unger founded a second home: the ideal place to develop the work and passions of her life, especially the photography. 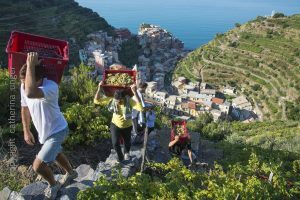 One of her most beautiful projects pay homage to this territory and one of its most precious products, the grape: the book "Cinque Terre - Vineyards with Sea View". Its second edition is published, enriched with new content, by Sagep Editore, with a double text in Italian and English that will also satisfy foreign readers, and is an exhaustive tribute to Riomaggiore, Manarola, Corniglia, Vernazza, Monterosso, their surroundings and centenary crop of vines, which develops in terraces: a unique landscape, recognized by UNESCO a World Heritage Site. The work of Catherina Unger tells and illustrates the various components of this world in detail: the dry walls, the Cinque Terre DOC wine, the Sciacchetrà DOC, the commitment of the Manarola Cinque Terre Foundation for the preservation of the land, the vineyards and the cellars - whose history and production are deepened - and the transport of materials, which requires unusual means in these rough and steep slopes. 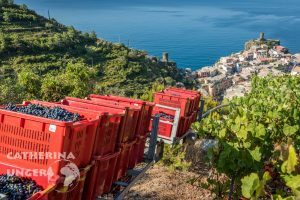 To close, the complete list of the vineyards of the Cinque Terre: a useful tool for both wine-making and wine lovers. "Cinque Terre - Vineyards with Sea View" is on sale at the Explora Shop in Manarola and the main wine shops in La Spezia and the Cinque Terre; you can also buy it online, in the store of the Sagep Publishing House. 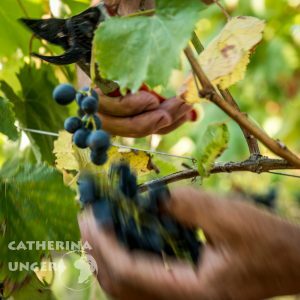 The author Photographer specialized in travel and reportage, Catherina Unger was born in Germany and at age 20, she moved to Italy: after a period spent in Florence, since 2001 she has been living in Manarola, in the Cinque Terre, where she still lives. 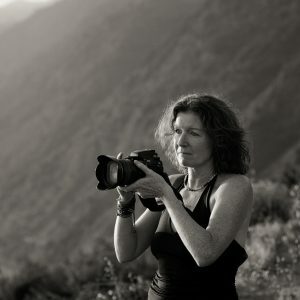 Founder and owner of Arbaspàa tour operator, putting her love for travel - which organizes in Italy and Africa with the Photographic Travel division – beside one for photography, inherited from the family. She collaborates with the important AWL-Images agency in London and she has been the protagonist of several exhibitions: among the most recent, "La mia Africa (My Africa)" at the La Spezia's H. Esposizione, dedicated to Namibia and " Il progetto dei rifugiati e la Fondazione Manarola (The Refugee Project and the Manarola Foundation)" , at the headquarters of the Cinque Terre National Park, with which he shas gained insights on important media and an excellent audience and criticism.